From the Robert Hogan collection. 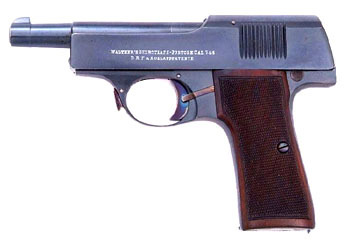 The pistol shown here, from the Robert Hogan collection, was made in the same era as the Walther Model 1, as it is of nearly identical design. I have never seen another pistol like this one. A German collector, Wolfgang Seel, tells me that the Venus- waffenwerke was closely linked to the Walther family, because Oscar Will’s mother, Charlotte Will, had the maiden name of Walther. 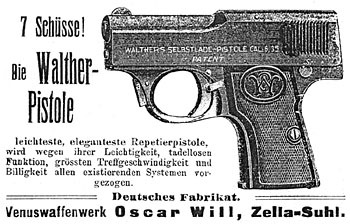 Herr Seel maintains that Oscar Will’s Venuswaffenwerke was in fact the manufacturer of the early Walther Model 1 pistols, and he provides a very early advertisement for the Walther Model 1, taken from the German journal Fachblatt: Sprengstoffe, Waffen, Munition 6 (1910/1911), No. 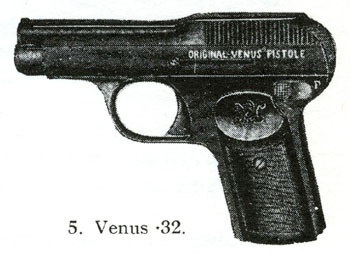 11, p. 127 and 129, which was published on 15 March 1911, and which clearly shows the gun made in Germany by the Venuswaffenwerk of Oscar Will. In this writer’s opinion, both the Hogan Collection experimental pistol and the Walther Model 1 bear a closer relationship to the 1900 Mannlicher pistol than to the 1900 FN Browning or the 1907 Dreyse referred to by Gangarosa. The Walther pistols, like the Mannlicher, have a fixed barrel with an open-top slide, top-mounted extractor, and the recoil spring located beneath the barrel, whereas the Browning and Dreyse both have side-mounted extractors; the Dreyse recoil spring surrounds the barrel, while the Browning’s is mounted above the barrel, and neither gun has a true slide. I am currently waiting for further photographs of the experimental Walther, but the lockwork of the Venus-Pistole will probably be similar if not identical to that of the Walther Model 1. There is no externally visible serial number on this gun, and I don’t know if it has an internal number or numbers. On the right side of the slide is a crown over N proof mark, which means that the gun was proved after the early months of 1912. The earliest Model 1 pistols I have examined have the ‘crown over crown’ over U, indicating they were proved before the early months of 1912, before the proof mark was changed. If the experimental pistol is genuine, I would infer that the Model 1 was made first, and that Walther produced the experimental .32 pistol based on the design of the earlier gun. Also on the right side is a Walther logo that looks a great deal like the Mauser powder barrel logo--in a round-cornered rectangle with the word “Walther” across it, squeezed smaller in the middle. I have never seen a Walther logo like this anywhere else. I will publish more information about this gun when I can. Meanwhile, I would be interested in hearing from anyone who has a similar experimental Walther, or any further information about the Venus-Pistol. GANGAROSA, Gene, Jr., The Walther Handgun Story, Stoeger Publishing, Wayne, N.J.: 1999. POLLARD, Hugh B., Automatic Pistols, W E, Old Greenwich, Connecticut. Reprint of 1921 edition. WALTER, John D., Secret Firearms, Arms & Armour Press, London: 1997. Copyright 2013 by Ed Buffaloe. All rights reserved.